Verso Publishing, c1983, 1st EDITION , 202 pages. VERY GOOD+ Condition Hardcover with a VERY GOOD+ Condition Dust Jacket protected with a Mylar Cover. This book is ex-library with usual markings, fep removed, & slight dj edgewear. Pages & Binding are NICE & TIGHT! This listing is ONLY for "The Yellow Rainmakers". 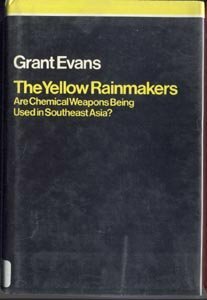 Were Chemical Weapons being used in Southeast Asia? Explores the accusation that the Russians were using chemical warfare against the mountain tribes of Laos. The author, through interviews with the Hmong refugees in Thailand and Laos, and extensive investigation of all physical evidence presents his results in this volume.